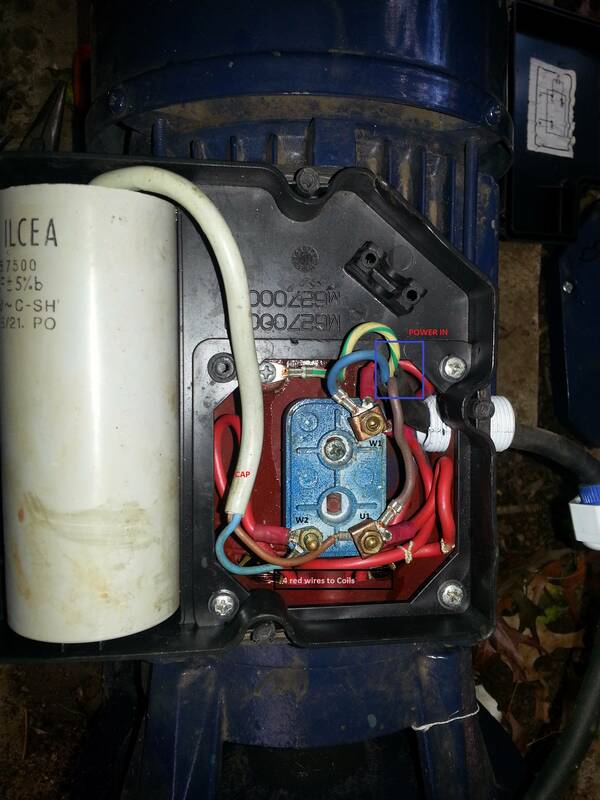 I am trying to install a single phase 220v electric water pump. I am fairly certain that it is wired correctly however the water pressure it is pumping out is absolutely useless. It is a newly refurbished pump, so my first assumption is that I have messed it up. As far as I am aware. The L and N should be connected to W1 and U1 respectively and then W2 should be connected to U1 (through the start capacitor). Just some notes. The motor is running warmer than I would like? Im not sure what temp it should run at. But this could also be a result of heat not being cooled down by the water as its not pumping the desired quantity of water. This site is not meant to be for appliance repair. However - things re motor design and operation may be able to be learned from this. Understanding what is being tried here and what may be wrong and how to try to be sure can be an immensely valuable learning exercise. "Just doing it" without understanding misses a major learning experience. The following is "bests guess" - a competent appliance repairer / installer would ideally be used. This has a good chance of working. Short: Swap wires C & D. BUT read all below first and try to understand. There are (you say) 4 red wires. These are probably 2 for run winding and 2 for start winding. The start winding is in series with the capacitor (large white cylinder). Run winding should connect across mains directly. Start winding should be in series with capacitor. You MAY have start and run windings swapped. I have labelled red leads A B C D in white. I have labelled terminals W1 U1 W2 in red. 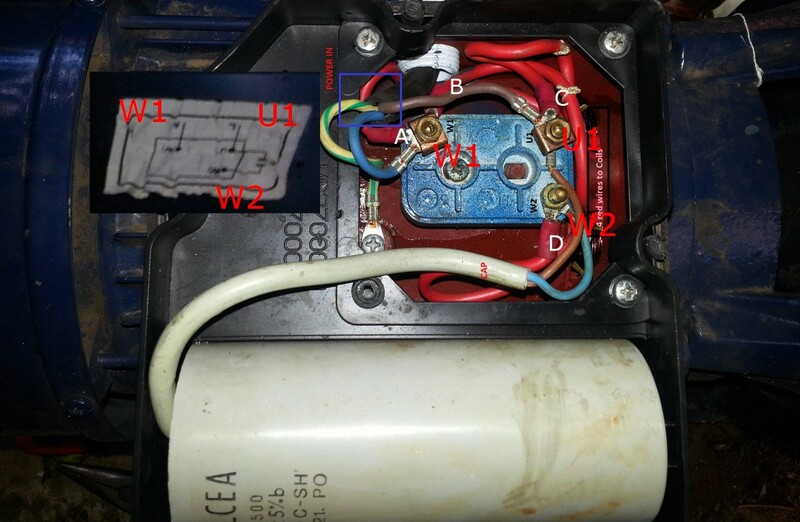 I have attached an image of the correct wiring diagram copied from your picture. A-C OR B-C should be Run winding. A-D or B-D should be Start winding. Start winding resistance is PROBABLY greater than run winding resistance. Probably. Find which wire pairs belong together. If the winding connected to W1-U1 is higher resistance than that between W1-W2 try swapping the windings - This SHOULD be as easy as swapping C on U1 with D on W2. There is a very small chance that some other connection has been made by I'd not expect that to work at all EXCEPT if there was a wiring error in the cord - which is possible but less likely. Continuity checks: Check which wire belongs to which other one with a meter first as above. 1st trial current limiter: Adding a large wattage series light bulb or better still an electric kettle element in series with the motor in the phase lead makes it harder to blow things up. Adding a series kettle element is optional but greatly reduces the current than can flow if you do something "inadvisable" [tm]. Not the answer you're looking for? 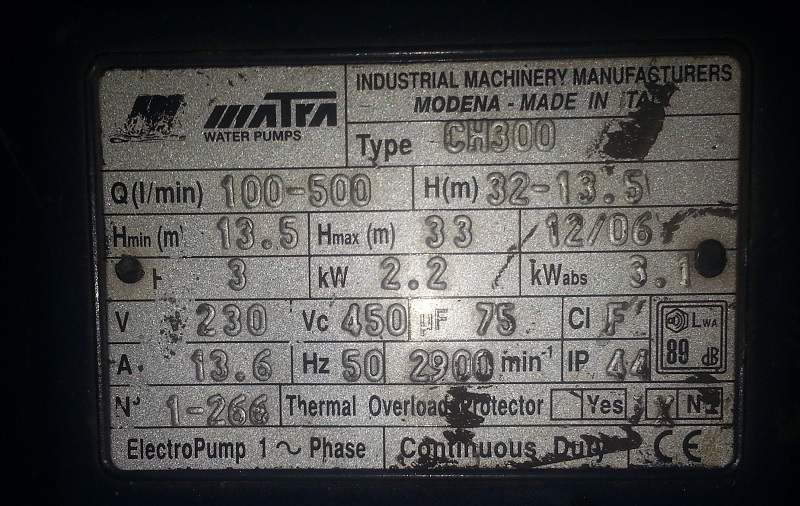 Browse other questions tagged motor ac single-phase or ask your own question.